Can I follow someone on Facebook again that I've Unfollowed? HomeunfollowCan I follow someone on Facebook again that I've Unfollowed? Can I follow someone on Facebook again that I've Unfollowed? Here's how to reconnect with the pages, groups, and people you've previously unfollowed or disconnected with on Facebook so far. Unfollowing someone on Facebook is not a bad thing. Facebook unfollow feature enables people to control who they interact with on the social networking website. So, if you're in search of the steps you need to follow to reconnect with the people thus far unfollowed on Facebook, you're at the right place. 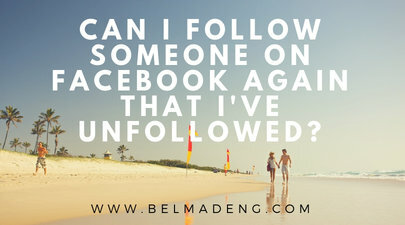 In this post, you'll see the first-hand guides on how to refollow the people you've disconnected with or unfollowed in recent months on Facebook. 4. Click "reconnect with people and groups you unfollowed" from the pop-up. Once you do that, you'll see a message like this one; "You chose to stop seeing posts from these people and groups. Click to follow them again and see their posts in your News Feed." You'll also see the list of all the pages, groups and the people you've unfollowed beneath. 6. Finally, click done at the bottom right of the dialog box. That is how to refollow or reconnect with the people you've unfollowed in recent months. Proceed on Facebook and follow the above steps to reconnect with that your aunty or brother you've unfollowed ASAP.